This Christmas, the BBC offers a new three part adaptation of E.F. Benson’s Mapp & Lucia novels set in 1930 in the quaint village of Tilling. 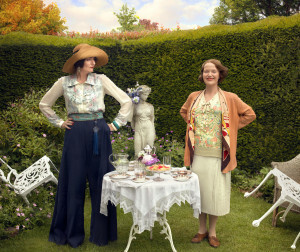 The eccentric residents live in a world filled with gossip and petty one up-manship and the village’s renowned schemers, Miss Elizabeth Mapp and Mrs Emmeline Lucas, battle for social supremacy over garden produce, bridge and a fund-raising fete. The mini-series is a satire, adapted and starring Steve Pemberton (The League of Gentlemen, Benidorm) and directed by Diarmuid Lawrence (The Mystery of Edwin Drood, Emma). Miranda Richardson (Parade’s End, The Phantom of the Opera) plays Mapp with Anna Chancellor (Pramface, The Hitchhiker’s Guide to the Galaxy) as Lucia. Starring alongside the pair are Mark Gatiss (Sherlock, Match Point Match Point), Frances Barber (Silk, Doctor Who), Felicity Montagu (Alan Partridge, Bridget Jones’s Diary), and Gemma Whelan (The Wolfman, Gulliver’s Travels). In July 2013, the Mapp and Lucia production team filmed in Kent when they visited period railway Kent & East Sussex Railway‘s Tenterden Station. Kent & East Sussex Railway is a ten and a half mile rural light railway from Tenterden to East Sussex. Kent & East Sussex Railway has previously featured in various film and TV productions such as Last Passenger (2013), I Can Cook (2011) and Countrywise Kitchen (2011). Mapp and Lucia starts on BBC One on Monday 29th December 2014 at 21.05. This entry was posted in Filmed in Kent and tagged Anna Chancellor, Felicity Montagu, Frances Barber, Gemma Whelan, Kent & East Sussex Railway, Mapp and Lucia film locations, Mark Gatiss, Miranda Richardson, Steve Pemberton, Tenterden, TV Drama. Bookmark the permalink.